While I was searching for a picture for my header, I came across this photo. Now that I have established an opinion supporting print and technology, I believe now I can bring up the biggest problem for writers today. What will become of our craft now that books are becoming more popular in electronic format. We’ve traded our pens and printing presses for keyboards and computer software. The idea of electronic books is not a new one as it has been around since the 1970s thanks to Project Gutenberg. 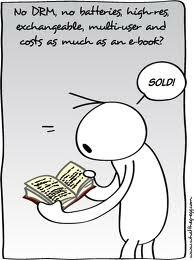 Yet, making books that aren’t readily available for free online is different from replacing the print medium altogether. So, here is your introduction to my internal struggle of being a book purist (believing in the paper and the print version of a book/story) and adapting to the advancing technology of the future.